Nicolas Anelka, also known as Abdul-Salam Bilal, is international soccer’s answer to pro basketball eccentric Ron Artest, also known as Metta World Peace. Both men have a history of letting impulsive behavior overshadow their superb athletic talent. The 35-year-old Anelka (who converted to Islam in 2004) was considered one of the best strikers in the world in his prime. But a handful of controversial incidents both on and off the field nearly made him a pariah in the sport. During the 2010 World Cup, for example, Anelka was sent home and eventually given an 18-match international suspension for reportedly cursing out France national team coach Raymond Domenech during halftime of a loss to Mexico. 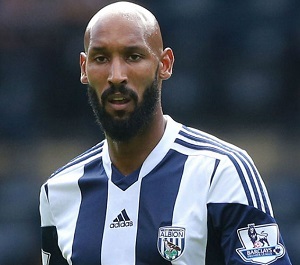 In 2012, while playing for Shanghai Shenhua in China, Anelka got into a verbal altercation with a fan. Earlier this week, Anelka made his debut for Mumbai City in the Indian Super League after serving a five-match club-level suspension — and paying a fine of approximately $127,000 — for making an anti-Semitic gesture on the field while playing for West Brom last season. The English club ultimately terminated Anelka’s contract for gross misconduct, which included comments he’d made on Twitter. “The Frenchman came in with a bit of a reputation of someone who might disturb the peace of the dressing room so managers have to take that into account,” wrote Davies in his column for Sky Sports. He continued: “He was a private person, I got changed next to him and he wasn’t one to come in and start conversations. He was quiet and shy. “When he got married he invited a lot of the staff and groundsmen — he flew them over to Morocco, all expenses paid. Gestures like that were superb,” concluded the 37-year-old, now at Preston North End. It’s just another example of how the one-dimensional caricatures of athletes that the public and media create are rarely (if ever) accurate and cannot capture the entirety of a person. Anelka, like Artest or Mike Tyson or whatever appointed sports villain you want to choose, has more to him than one tasteless gesture and a handful of verbal explosions. Soccer’s bad boy performing an exceptionally good and thoughtful deed doesn’t fit the box he’s been put in. So maybe we should stop crafting confining boxes altogether.